ZamaPara specializes in artfully crafted songwriting which is blended with influencesincluding Dave Matthews Band, Afghan Whigs, Wilco, Bob Marley, Counting Crows, The Police, Stevie Wonder to name a few. The end result is an innovative style of straightforward heartfelt melodies and soul-filled lyrics. Our sound is then mixed with a strong dose of reggae influences along with dueling percussionists with variations of funk overtones. ZamaPara’s unique Folk-Ska-Rock style is enhanced by its live performances which are always high energy shows that get people dancing as well as entertaining the audience with its storytelling. 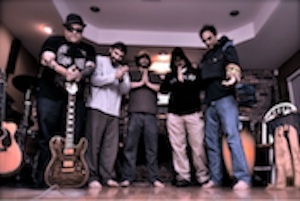 ZamaPara has worked since June 10, 2011, with a collective focus on their debut album which is now before you. This 12 song album titled’Peace of Mind’ was released in January of 2013 and has already received positive music reviews and has generated requested airplay with over one hundred radio stations worldwide. The release of ‘Peace of Mind’ is the result of a lifetime of experiences crammed into a year and half of recording and editing with passion and sweat at Fudge Studios in New Orleans, LA with the support and guidance from engineer/producer Jacques DeLatour. WithoutJacques’ involvement, this album would not be the same. This album is the culmination of Randy Perrone’s vision of peace, energy, positive thoughts, and his choice to live life to the fullest; which was to find happiness within and to overcome hardship of life with a smile. Randy’s musical journey started in 2001 with the help and encouragement of his twin brother Rusty. The two started the process by transforming their bedroom closet into what would become Randy’s first studio recording experience and from there they started the beginnings of what we now know as ZamaPara. Over the next several years Randy and Rusty would build another Studio, which Randy continued to hone his craft cultivating this unique sound. Randy was able to find kindred musicians who shared his vision and artistic goals in aligning with Fernando Puig, LeMar “Rip” Williamson, Michael Wheat, and Chad Toups in order to elevate his music to the next level. These newfound brothers and best of friends began the mission of working together to create the music you have before you now. We bring this album and message to you with a bittersweet heart, because Randy Perrone, our leader, vocalist, acoustic guitarist, songwriter and best friend passed away 02/27/2013 due to complications in removing a rare brain tumor. Randy requested that in the event of him not returning back to us physically, that we hold fast to our promise to keep his vision and music alive and to continue our mission of spreading ZamaPara to the rest of the world. This album is not the end for ZamaPara but the continuing journey that Randy had already planned. We feel very fortunate to have more than a whole album’s worth of additional material, most of which Randy had recorded in advance of the surgery. We are eagerly getting ready to finish recording with plans to release. Our excitement and commitment to Randy drives us to release this next oeuvre of songs, celebrating Randy’s voice and the ZamaPara sound. Randy’s biggest gift to us was his friendship and his music which will always be filled with his heart and soul which will now live on forever in these recordings. Location ~ New Orleans LA.